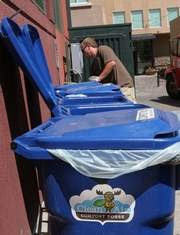 A: We offer a pickup service for food, yard and other organic waste for schools, businesses, restaurants and homeowners. We also offer short-term and/or one-day services. We provide monthly reports on total compost usage by the pound to help with tracking – great for Climate Wise members. We also provide an extensive and ongoing educational outreach program – education is vital in helping people understand why organics recycling is important for our communities, local agriculture and the environment.